It's a pretty cool bird, but its not typed to prophets in the Bible. Are prophets actually compared to eagles in the Bible as William Branham claimed? What is the importance of an "Eagle Ministry"? Five (5) verses refer to vultures, not eagles (Job 39:27, Prov 30:17, Micah 1:16, Matt 24:28 and Luke 17:37). For a detailed discussion, see our article on Matthew 24:28. Four (4) verses refer to the 'unclean' animals that were not kosher to eat (Lev 11:13 & 18 and Deut 14:12 & 17). The primary reference to an eagle is as a descriptor or an illustration of such things as fierce swiftness and strength. It is NEVER used as a reference to prophetic wisdom or vision. Other than King Saul (2 Sam 1:23 where Saul and Jonathan are referred to as "swifter than eagles"), there are ZERO prophets or seers that were likened to an eagle. 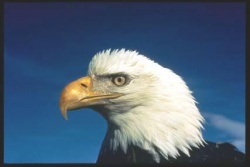 William Branham stated that an eagle could fly higher than any other bird. But is this true? One of the most impressive altitude records for birds is that of a flock of Whooper Swans which was seen on radar arriving over Northern Ireland on migration and was visually identified by an airline pilot at 29,000 feet.. The Bar-headed Goose is one of the world's highest-flying birds, having been heard flying across Mount Makalu – the fifth highest mountain on earth at 8,481 m (27,825 ft) – and apparently seen over Mount Everest – 8,848 m (29,029 ft). But the world record for high altitude flying by a bird is a Ruppell’s vulture (gyps rueppellii) which collided with a commercial aircraft over Abidjan, Ivory Coast, at an altitude of 37,900 feet in November 1973. The impact damaged one of the aircraft’s engines, but the plane landed safely. The avian altitude record in North America is held by a mallard, which collided with an airplane on July 9, 1963, at 21,000 feet above Elko, Nevada. Eagles are not found in any of the records for highest flying birds. 2 Samuel 1:23 - Saul and Jonathan were lovely and ||pleasant in their lives, and in their death they were not divided: they were zswifter than eagles, they were astronger than lions. A prophet in the Bible is a eagle. He goes higher than other birds, and he can see way off, things coming. The Bible likens His prophets to being eagles. Now, a eagle can soar higher than any other bird. If another bird tries to follow an eagle, he'd die, because he--he--the eagle's made special, and he can go so high if the hawk trying to follow him, the hawk would disintegrate in the air. He just couldn't follow him; his feathers would fall out; he'd come apart. But the eagle is a special bird. Now, what good would it do him to go way up there in the air unless he could see way off? He'd be blind himself. But see, nature has provided the eagle with an eye that he can see as high till you can hardly see the eagle yourself: some of them fourteen feet across their wings. You can hardly see the eagle with your eye. But he can see any little moving object on the ground. Now, God likened His prophets, His preachers, to eagles. He calls Himself, "Jehovah Eagle." He's a eagle Himself. In the Bible His prophets was considered eagles. 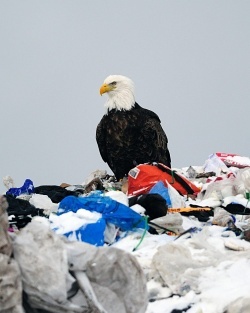 The eagle, how it would... It could climb higher than any other bird. You know, Jehovah is an eagle, Himself, and He calls us eaglets. His prophets are eagles, seers. Everyone knows that a prophet is called the eagle, in the Bible. ↑ The New International Version (Grand Rapids, MI: Zondervan, 2011), Le 11:13–19. ↑ The Holy Bible: King James Version, Electronic Edition of the 1900 Authorized Version., Ex 19:4 (Bellingham, WA: Logos Research Systems, Inc., 2009). ↑ The Holy Bible: King James Version, Electronic Edition of the 1900 Authorized Version., 2 Sa 1:23 (Bellingham, WA: Logos Research Systems, Inc., 2009). ↑ The Holy Bible: King James Version, Electronic Edition of the 1900 Authorized Version., Le 11:13–14 (Bellingham, WA: Logos Research Systems, Inc., 2009). ↑ The Holy Bible: King James Version, Electronic Edition of the 1900 Authorized Version., Dt 14:12–13 (Bellingham, WA: Logos Research Systems, Inc., 2009). ↑ The Holy Bible: King James Version, Electronic Edition of the 1900 Authorized Version., Job 28:7 (Bellingham, WA: Logos Research Systems, Inc., 2009). ↑ The Holy Bible: King James Version, Electronic Edition of the 1900 Authorized Version., Is 34:15 (Bellingham, WA: Logos Research Systems, Inc., 2009). This page was last edited on 30 June 2018, at 20:14.